Drones and unmanned aerial vehicles are increasingly used in research on wildlife. Their wide applications can also give interesting insights into habitat use and population distribution. However, the disturbance they might be responsible for, on species and especially in protected areas has yet to be investigated. We assessed and compared the behavioural response of 11 southern seabird species at the Crozet Islands, Southern Indian Ocean, to drone approaches at specific altitudes. We first show that the behavioural response differed between species depending on the altitude of the drone approach. At 50 m of altitude, only one of the studied species showed a detectable reaction, whereas at 10 m, most species showed strong behavioural postures of stress. Adult penguins breeding in large colonies, and some albatross species showed little behavioural response even when the drone was as close as 3 m, whereas other species such as giant petrels or cormorants appeared highly sensitive to drone approaches. 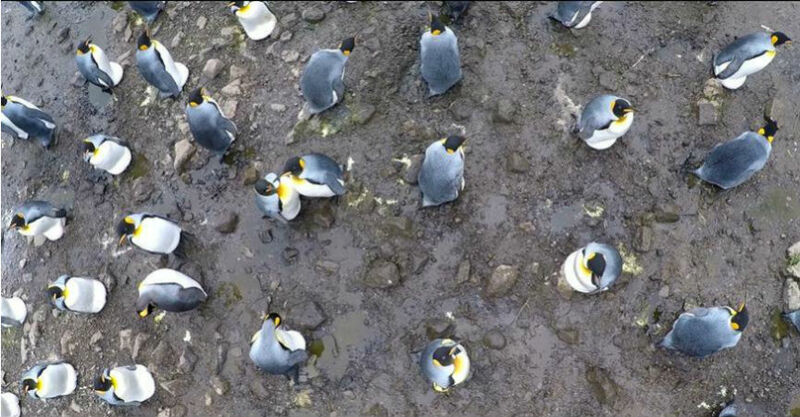 Among King Penguins, although incubating adults showed little signs of behavioural stress, non-breeding adults and fledglings in crèches exhibited strong behavioural responses to the drone approach. Monitoring heart rate allowed us to investigate the link between behavioural and physiological response to that specific potential stressor in king penguins. Whereas we confirmed the expected link between physiological and behavioural response in chicks, breeding adults showed no behavioural sign of stress but had a significant increase in heart rate, the relative increase being higher than in chicks. All together these results have important implications for the conservation of species and should be helpful for future legislations on the use of drones.